• It is dangerous to walk between two uncoupled freight cars or a freight car and a bumping post. 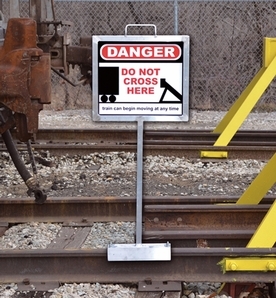 Mark these "no-go" areas with the No Crossing two-sided danger signs (16"x18") with magnet base aluminum sign holder. • Bold graphics can be seen easily from both sides of the track. Magnet base instantly grips surface of flush or exposed rail so worker stays clear of track when installing or removing holder. • Weight of sign and holder 10 lbs.